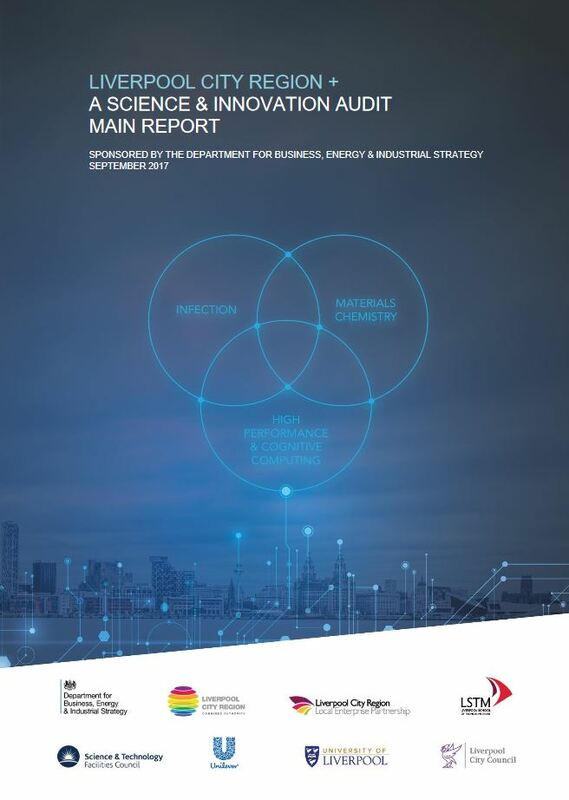 The Liverpool City Region+ consortium have published their Science and Innovation Audit focussing on Materials Chemistry, Infection and High Performance and Cognitive Computing. Their ambition would see the Liverpool City Region become world-leading in tackling infectious disease, providing a hub for commercialising new material chemistries, and building on computing strengths to create a vibrant and disruptive digital technologies cluster. An open innovation ecosystem built on co-funded and co-located research within the Knowledge Quarter and Sci-Tech Daresbury. Infection needs a targeted inward investment strategy, continued investment in research assets, in addition to ensure that supporting activities e.g. finance, business support are in place.. Knowledge transfer around the regional innovation eco-system is key to the continued development in Materials Chemistry. High Performance and Cognitive Computing needs to broaden activities to include industry and service sector user bases, as well as building HP&CC activities into the core business in the region. Centre of Excellence for Infectious Diseases Research+ (CEIDR+) will build a portfolio of projects with collaborating companies leading to a new brspoke facility for co-location of research and industry users. MIF Nexus will support major companies through access to shared robotic testing, scaleup and proof-of-concept services in Materials Chemistry. “Deep Change” will embed High Performance and Cognitive Computing technologies and methods across all parts of the LCR+ regional economy.